Yesterday was a blast. We had our own mini cheese party since we have all this cheese from a couple weeks ago. Our friends came over and we ate, played games, and visited. 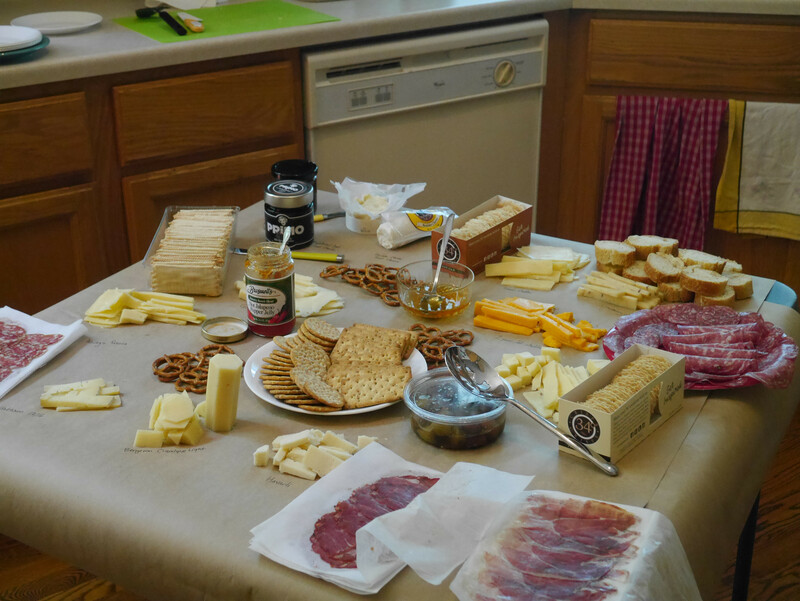 The spread turned out quite nice – I laid butcher paper on a table and under each cheese I wrote down what it was. We had lots of different meat and crackers too along with jams, honey, and olives. I suggested that we do this once a month because it was so delicious and so much fun. Even though we gave our friends chunks of cheese to take home we still have quite a bit left. I decided I’m going to have adult lunchables for lunch this week with all the leftovers. After our friends I left and I rested a bit from all the calories I ate, Gene and I played Mario Kart with Sean, who was all the way in California! He also bought a Nintendo Switch and we figured out how to play together. It was awesome and we were neck and neck for most of the races – which is always a good sign of a good game. Might play with him some more later today! Previous Post Going to Wyoming!